Holy. Actual. Heck. I AM HURTING. 2x1 115#, 2x1 130#, 1x1 140# !!! So. Sore. Power yoga time!! WHY DID MONDAY MAKE ME SO STIFF AND SORE? Those deadlifts!! Legs. Today my Polar HRM was acting up (maybe because of the humid weather here in TX?) and it didn't save my workout! Poo. It also was reading that I had only burned around 250kcal after my LEG workout (its usually around 400 on leg day). Not that calories are the issue here, just that I think I was working harder than that! 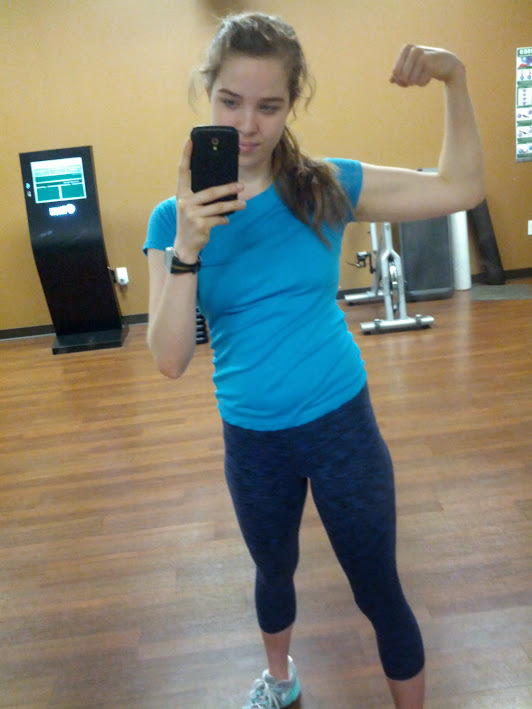 I did a HIIT circuit and finished up with some biceps and triceps. Like what. I started my day off with 16 minutes of HIIT intervals, rotating between burpee variations and plyometric moves. Later I headed to the gym for shoulders... I learned a hang clean, which I've been too scared to try on my own. A friend at the gym helped me.